The Micro Block MK2 is an impoved version of Micro Block 02/2015. Micro Block MK2 is a compact loudspeaker with extremely well-behaved sound dispersion and other very good sonic properties at a low price. The Micro Block MK2 is home to a Wavecor dome, the TW030WA12, and the subwoofer SW118WA02. Micro Block MK2 has been developed by Bernd Timmermanns. Its crossover consists of a 3rd order high-pass for the tweeter. A resistor as voltage divider in series to the tweeter got a capacitor in parallel to lift the highest frequencies. The woofer is connected to a 2nd order low pass filter. 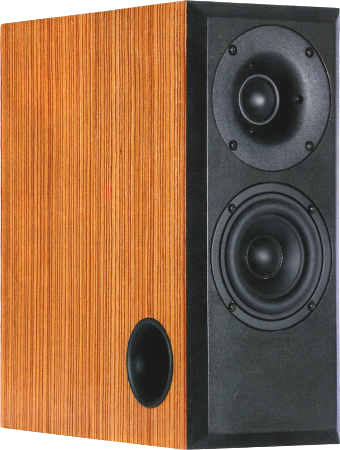 An RCL curcuit in parallel to the woofer is smoothing the frequency response between 80 Hz an 400 Hz. The frequency response is absolutely flat on axis between 50 Hz and 30,000 Hz. The decay spectrum (waterfall diagram over frequency) is exemplary, free of any disturbing resonances. At 90 dB and 1 m, non-linear distortions remain below 0.35 % almost everywhere above 500 Hz. The high-end kit contains three Mundorf MCAP EVO silver gold oil capacitors. The coil for the woofer is a Mundorf copper foil coil CFC 14. The other coils are backed varnish coils for diminishing the microphonics effect. Current flowing through the coil creates a magnetic field which on itself sets the reel of wire in motion. That motion induces a voltage in the coil which adds itself to the original signal.